The chamber of commerce is a great place for anyone looking to make local connections and promote their business. But it’s more than just writing the check. It requires being involved and being proactive, taking advantage of your membership. It takes time, something small business owners often lack. But the result of not investing your time and effort is often a disappointing chamber experience. Go to Events. This is a great time for you to go and meet new people who are just like you. They are at the chamber to network, meet new people, and grow their business. You’re all tied together by a common theme, improving the local business climate. Going to events regularly will allow you to develop relationships with people and become familiar with other members. It will also allow other members to become familiar with who you are and what your business is, what product or service you provide. We are all more likely to recommend a fellow chamber member when someone asks for a referral because we know them and have developed a relationship with them. Join a Committee. Chambers are run by members who volunteer to help out. Committees or the board of directors is a great way to get involved. Join a committee that you are interested in or have expertise in or have a passion for. Chamber events require committees of people with a variety of skills or interests, so be proactive, join and develop relationships with new people while working together to achieve a common goal. Take Advantage of Offers. At the Redlands Chamber we can help members by offering reserved e-mail blasts, sharing info via social media, offering advertising and marketing opportunities, sponsorships and promotions. The catch is to reach out to tell the chamber what you want. It’s important to let the chamber know whatever you want to share. This is where proactive comes into play. Connect Socially. When making connections through your chamber it’s important to follow up to help develop your relationship. Previously it’s was common to send an e-mail after an initial contact or meeting. Now you can connect on LinkedIn, Twitter, Google+ or Facebook to learn more about the person you connected with and their business. Go the extra mile and share their content, they will likely return the favor. 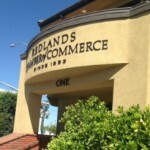 Social media, like the chamber of commerce, is about developing relationships. Use it to enhance your chamber experience while in between events or committee meetings. It’s a great way to stay in touch. Follow Up. Following up with people is often overlooked. You have met them at the monthly event and connected socially, but what about a follow up meeting? Invite your new connections out for a cup of coffee or lunch. This will help you get to know them and their business better while providing an opportunity to share more information about your business. It doesn’t stop at meeting people and connecting socially, follow up and solidify your relationships. The chamber of commerce is a must for any local business looking to grow. It helps the community and helps you make connections that can grow your business. The formula is simple: you get out of it what you put into it. If you make the effort, the chamber of commerce can be a rewarding experience both personally and professionally….it’s not a membership…… it’s a partnership.